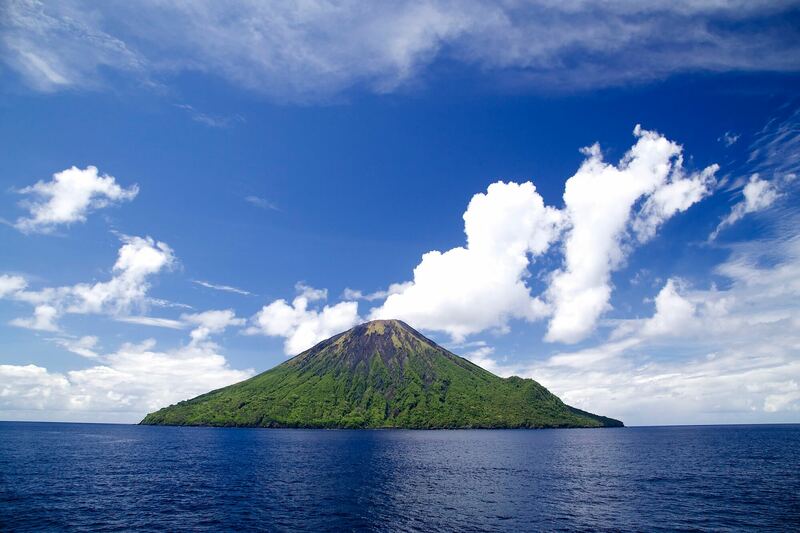 Tinakula is a conical stratovolcano which forms an island north of Nendo in Temotu Province, the Solomon Islands. It lies at the north end of the Santa Cruz Islands. It is about 3.5 kilometres (2 miles) wide and rises 851 metres (2,792 feet) above sea level, rising three to four kilometres (1.9 to 2.5 miles) from the sea floor. It erupts approximately every hour in a plume of ash and rocks. The volcano was first recorded in eruption in 1595 when Álvaro de Mendaña sailed past it. The island is uninhabited. A previous population was eradicated when the volcano erupted around 1840 and pyroclastic flows swept all sides of the island. In 1951, polynesians from Nukapu and Nupani settled on the island, which reached a peak population of 130, before it had to be evacuated with the 1971 eruption. The village of Temateneni was on the southeast coast. In the late 1980s, two families (less than 10 people) from Nupani made another attempt at settlement. Transport can be arranged, but landing on the island is very difficult since there are few good beaches. One must bring plenty of water and be prepared to swim ashore. The island is covered with jungle, except for the western side, which is covered with ash. It was scraped by landslides in 1965. When the volcano erupts, it is possible to watch large boulders tumbling down the mountain side.